Any new or expectant mother should have a changing pad at the ready at any time while at home. 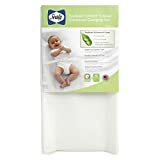 Most modern pads are usually made of a double layer of vinyl or other waterproof material, which prevents liquids from soaking through while you are changing your child. 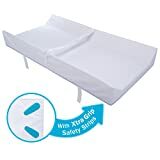 The best baby changing pad should come with raised sides as an extra safety measure and a non-skid back which will make changing your baby on any surface a breeze. 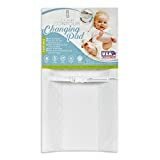 You can find these baby changing pads online or in brick-and-mortar stores, and our article will go over the top ten best changing pads including the best portable changing pad this year. 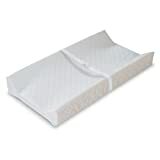 This soft yet firm changing pad by Dream on Me has contoured edges and a safety strap for additional security that prevent your baby from rolling off of it – however, we do recommend constant supervision with any pad. 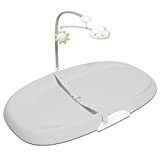 The pad also has 2 attachment straps to secure it onto any surface but be wary that the straps should be screwed down onto the changing table for extra grip. The innovative soybean formula from Sealy inhibits indoor air emissions and enhances the durability of the foam material. As with most of the best diaper changing pads, this one too is waterproof and contoured so that the baby snuggly fits tightly onto it. The Sealy Soybean Comfort meets ASTM guidelines offering a sleek and easy to clean cover, enhanced with soybean oil. The diaper changing pad also comes with two quilted fleece pads so that overwhelmed moms can have one less thing to worry about. The fourth pick for the best changing pad is the Munchkin Secure Grip changing pad. 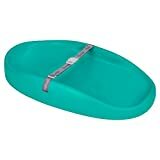 This pad features two high walls with openings on both ends so there is room for your baby to grow and you don’t have to reach over anything to change them. The Muchkin pad comes with durable, non-slip strips and a safety strap with a quick release system for easy, secure use. Recommended read: You might also be interested in our articles on the best cloth diapers of the year and the best overnight diapers for your baby! The LA Baby waterproof contour changing pad’s greatest feature is that it’s non-skid. So as you would imagine it’s ideal for typically fussing babies that don’t seem to stay put. And it also features a safety harness with a quick release buckle so you can make sure there’ll be no mess with this changing pad. The cover is made of quilted vinyl and, as expected, it’s waterproof, features entirely non-toxic and allergen-free materials. With a name like PooPoose, you know the Wiggle Free diaper changing pad will keep the mess contained when you’re changing your little one! This pad features a very secure and swaddle-like harness to keep the baby in place with a gentler touch than most other changing pads. Owing to its simple design with a removable hook and loop strap, the changing pad works pretty well both for newborn babies and toddlers. According to the product description, no extra covers are necessary. This 4th best baby changing pad on our list is the LA Baby Waterproof changing pad. It consists of a waterproof, soft, removable cover with high walls to keep your baby safe. The pad measures 30 in. by 16 in. by 4 in. for maximum comfort and ease when you use it. The non-skid back and safety straps ensure your little one will be safe, and the plush build and backing provide extra support. The cover is not the best quality. Recommended read: If you’re looking for high-quality baby gear, we also recommend going through our articles on the best diaper pails for your home and the best diaper bags for when you’re on the run! 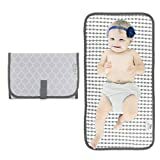 This baby changing pad by Summer Infant is a bestseller on Amazon because it is so versatile and easy to maintain. This pad features a safety strap with a quick release buckle for added security and is 100% waterproof. This pad is double-layered, so your baby will be extra comfortable, and features a non-skid bottom. It measures 32 inches long by 16 inches wide, so you have plenty of room to change your baby, and is also lightweight so i’s a serious contender to be the best portable changing pad title. You can buy a cover or two and simply switch them out when one gets dirty. To wash the pad itself, simply wipe it down with a mild disinfectant. 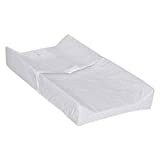 This pad is, according to ratings and reviews from hundreds of verified customers, the best changing pad to buy in 2019. Durable, this baby changing pad can easily last years! The Skip Hop Nursery style changing pad is very basic but that doesn’t mean it isn’t good. It’s actually one of the most efficient and ergonomic changing pads we’ve reviewed so far. The small size might deter some parents, but it should fit any kind of changing table. Furthermore, the baby safety harness reaches around the pad and doesn’t protrude it. One major disadvantage with other pads was that they had holes in the pad for the harness, which promoted liquid retention through the seams and into the holes. There’s no issue with that here! Twenty-first-century mommies are always out and about because not everyone can afford to stay at home and just care for the little one(s) – and not many people like that. For the working moms, the moms who are leading active lives besides parenthood, Comfy Cubs comes with the absolute best solution – a very portable but highly efficient changing pad. While this pad has it all – it is waterproof, extremely durable, lightweight, compact, and most of all – inexpensive, Comfy Cubs does not seem to sacrifice quality over affordability, as many other brands seem to do. This pad is large enough, it’s 100% waterproof, and it comforts your kid well enough for any situation – at home or on the go! Every changing pad on our list hits the mark for being durable and a great pick for both new and expectant mothers. They could all win in the best changing pad category for various reasons. But in the end, it all comes down to personal taste and which option best suits your unique needs. Nevertheless, we believe that the models from Skip Hop and Comfy Cubs are some of the best choices you could make based on the opinions of countless parents who have purchased and actually used them. Do you have other suggestions that were not listed in this top? according to the most recent user reviews.